The results of qualitative and quantitative assessment of risk and modeling of the consequences of accidents can be used for geographical placement and identification of the industries, to determine all necessary parameters for the design of equipment and facilities, for comparative evaluation in choosing different designs and plans, to determine and apply appropriate models for crisis and disaster management, for the identification of severity of the possible consequences of accidents and damages on the equipment, and hundreds of other items. “Analysis of Consequence Modeling Software of PHAST and ALOHA” is the title of article that has been presented by Langari in 2010. In this paper, initially, the necessity of the assessment process of consequences and steps of its implementation has been highlighted and ultimately the advantages and disadvantages of PHAST and ALOHA software have been studied and analyzed. 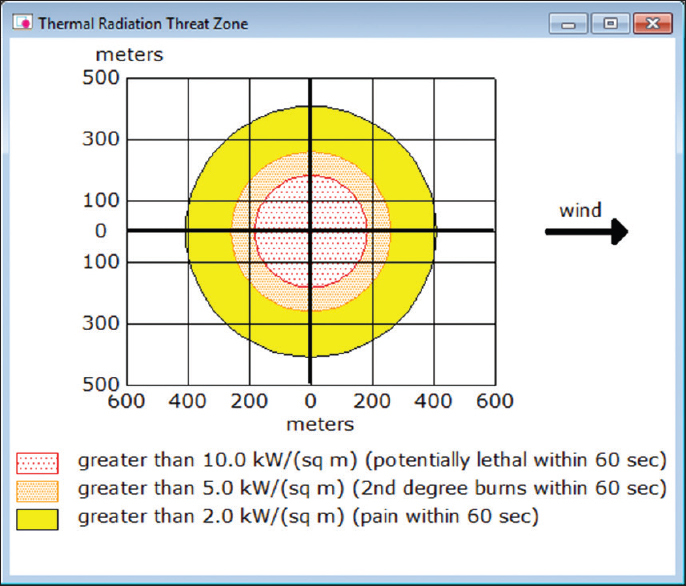 PHAST and ALOHA have been compared in terms of hazardous substances data bank, prediction of concentration in a specific moment and place, radiation graphs of fire and blast wave, wind speed, geographical conditions, land surface roughness, distance and duration of modeling, and selection of specific consequences by the user and by examining the menus and graphs of both software. “The Role of Bowtie Method in the Improvement and Optimization of the Risk Management Process” is the title of a study that has been conducted by Sameti in 2011. It is a descriptive study that in addition to introducing the bowtie method, it also shows the advantages of bowtie method in optimizing risk management through awareness and satisfaction of workforce and also through improved inspection processes. In this study, the bowtie model clearly describes the required balance through the relationship between hardware and software systems as well as the relationship between the hazards and their consequences, and on the other hand, the necessary barriers and compensation measures designed to prevent accidents and chain of consequences and the way of controlling them in safety, health, and environment management system are also demonstrated by the bowtie model. “Application of Bowtie Techniques in the Analysis of the Accident in SRP unit of Tehran's Tondgooyan Refinery” is the title of article that has been presented by Tekye et al. in 2011. In this study, one of the important process – accidents, which has led to the death of people at the National Iranian Oil Refining and Distribution Company, has been modeled using the bowtie technique (the most effective and modern method for analyzing the events). The study showed that the use of bowtie technique, which is a systematic and analytical method, is very effective in determining the causes of events and also in specifying critical tasks aimed at ensuring the integrity and effectiveness of ongoing controls and plays an important role in identifying key performance indicators of HSE and in improving them. “Propane Leak Propagation Modeling in an Industry” is the title of an article that has been conducted by Golbabaei in 2012. The case of the study was an industrial center in the East of Tehran. Input data were entered into software on the basis of the regional weather conditions and it was found that at a distance of 1 km, propane density is 17 times higher than the existing TLV, and on the other hand, the effect of explosion is more destructive at this distance, which results in the loss of around 916 personnel and 130 drivers as well as financial losses of at least 401 billion Toman. Therefore, recommendations such as constructing and equipping crisis management and the rescue center, installing dikes, fencing and controlling the traffic, ensuring that the equipment near the tank have the “Ex” (a symbol for an explosion-protected devices) symbol to prevent and control the hazards of dissemination of propane were proposed. An article entitled as “Application of Bow-tie Method in the Risk Assessment of Pigging Operations of Gas Pipelines in the Tenth Region during the Gas Transmission Operations” was carried out by Kabiri et al. in 2014. The application of bowtie method in the risk assessment of pigging operations of gas pipelines in the tenth region during the gas transmission operations was examined and studied in this paper. In this study, the bowtie method was presented as a useful tool for introducing risk. “Analysis of Road Accidents Caused by the Transport of Toxic Gases in Hassan AbadLocated on the Transit Route of Tehran-Bandar Abbas” is the title of the study that has been conducted by Owari in 2014. In this article, the effects caused by the toxic gas leakage have been discussed. To simulate the affected area, Gaussian or heavy gas model was used, in which effects related to speed and direction of wind and atmospheric conditions were taken into consideration. For implementing the case study, the affected areas were detected using ALOHA software, and then, these areas were entered into Geographical Information Systems (ArcGIS v 9.3) and special features of GIS were used for the spatial analysis. Considering that the place of accident was the city of Hassan Abad, the number of people at risk of death from ammonia gas was equal to 386. Heyrani and Baghayi (2015) conducted a study which was entitled as “Risk Assessment of Oil and Gas Transmission Pipelines on the Basis of Fuzzy Bowtie Method.” In this study, the bowtie method was used in combination with fuzzy logic and by employing a Likert scale method for quantifying qualitative (linguistic) data in order to reduce uncertainty in risk assessment of No. 10 pipelines of Amak gas and No. 12 pipelines of Bangestan oil, in a way that, initially, factors affecting the safety of transmission lines were determined by preparing checklist, and then, the risk of studied pipelines were assessed using the mentioned methods. According to the obtained results, instructions were provided to reduce and control the potential consequences with emphasis on eliminating possible causes of them. “Modeling the Consequences of Hexane Leakage from Storage Tanks and Planning an Emergency Response Program in a Petrochemical Complex” is an article that was written by Beheshti in 2016. In this study, beside the explanation of factors that affect unloading and release of substances, ALOHA software has been used as one of the most appropriate software for modeling hexane emissions from the storage tank with the capacity of 579 thousand gallons in one of the units of petrochemical and on the basis of results of modeling, emergency response plans were prepared and presented at the time of leakage of hexane. According to the results of study, the diameter of the emerged pool is 200 m and up to 140 m around the reservoir, the concentration of hexane gas is 8600 ppm that threatens the life of people who live in this region. Consequence of hexane toxicity is the most serious danger that threatens personnel. Provision of response plan in emergency conditions would have an important role in limiting the harmful effects that are caused by the emission of hazardous and toxic gases. A study entitled as “Risk Assessment and Modeling of Consequences of the Blast Wave of BLEVE Phenomena of LPG Spherical Tank in a Refinery” was conducted by Komaei et al. in 2016. In this study, the risk of phenomena of boiling liquid expanding vapor explosion (BLEVE) was assessed using the bowtie method and consequence of blast wave of BLEVE phenomena was also examined and the resulting wave quantity and its impacts on the neighboring machineries and equipment were analyzed. In this assessment, generally five causes and two consequences were identified for BLEVE phenomenon. To reduce its consequences, 43 controlling measures were introduced to prevent the BLEVE phenomenon and the impacts of 31 control measures were identified. According to the conducted analysis, it was found that the spherical tank blast wave caused by LPG can lead to explosion of tanks that are near the LPG and it can create a chain of explosions. “The bowtie method: A review” is the title of article that was presented by Ruijter and Guldenmund in 2016. In this article, qualitative and quantitative bowtie methods are introduced. Quantitative bowties use a fault tree together with an event tree and barriers to calculate risk. Qualitative bowties use simpler cause–effect scenarios with barriers to communicate the risk to an audience. As whole, the previous studies highlight the importance of risk management and modeling the consequences of process accidents. It is necessary to identify and prioritize safety risks so that major factory risks can be managed in better manner. In this research, for the first time in car manufacturing factory, we identified the risks and hazards of industry based on the bowtie technique and ALOHA software. The strength point of this research is that the selected methods were able to assess and manage all the potential and actual risks in the Process of an Automotive Industry. The weakness point of this research is the lack of necessary collaboration between the factory staff. The present study was conducted to identify safety risks in car manufacturing factory and manage them using ALOHA and bowtie techniques. The research was carried out in unloading operations of waste thinner from temporary storage. This is an applied research. Data were collected using inspection, audit, risk assessment, safety checklists, documentation of past accidents, technical documentation of unloading operation, meteorological, and geographical information. Bowtie technique was used for risk management and ALOHA software was applied to modeling of fire and explosion consequences. Using these methods, it was possible to manage and control process hazards and risks. Control to Consequence – controls to reduce the effect of consequences. The process involves the systematic identification of hazards and effects, assessment of the associated risks, and the specification of the control and recovery measures which must be in place and maintained in place. The bowtie process is iterative and is often carried out by a team. Are the people and the staff, environment, assets and properties, current activities of organization, or even company's credibility at risk? What kind of causes and consequences exist? Is there any probability of failure of the controlling measures? What kinds of risks are involved and are they at a tolerable levels or as low as reasonably practicable? Is it possible to eliminate the cause? What kinds of controls are required? Can the potential consequences or threats be mitigated? What kind of preventive or corrective actions are required? Are these measures suitable and sufficient? The results obtained from the bowtie diagram, in addition to identifying the causes of accidents and making personnel ready for dealing with the possible consequences, provide the possibility to create a detailed and documented plan to prevent the occurrence of new accidents and the like for the management and all other responsible units. ALOHA software is a modeling program that is used professionally for training and planning in an emergency situation caused by the dissemination and release of chemicals in industries and factories. Significant hazards, including the hazards of toxicity, flammability, heat resulted from thermal radiation, and overpressure of explosive blast force (that can result in the release of chemicals) are modeled by ALOHA software. This modeling can include the release of toxic gases, fire, or explosion. Database of this software contains the physical properties of approximately 1000 common and widely used chemicals, and this database is editable and the data related to any chemical substance can be added to it. This software has very high accuracy and speed in performing the calculations and processing that are required for modeling. ALOHA software has been designed for responding and reacting in the shortest time possible and also for obtaining the most accurate and complete results, and it minimizes user errors. This software is able to check input data, and in the case of error, it notifies the user. In general, car manufacturing factories are consisted of various production halls and sections that each is responsible for a part of the production process. One of the most important processes is the process of painting the body of the vehicle. Paint shops of automotive industries are among the highly complex and sensitive parts that a set of chemical processes occur in them. One of the most important parts of paint shops are the circulation units. Preparation of paint for sending it to spraying cabins and robotic paint feed system is on circulation unit. In fact, paint circulation process refers to the series of activities in which paint is prepared for being sprayed and it is charged into the lines through the pipelines and once again, it is returned to the initial tank. Washing process of the paint transmission lines, spraying cabins, and robots are totally performed by chemical thinner. All the consumed thinner are returned into a cylindrical tank (with a capacity of several 1000 L) by a return line. The returned thinners are not usable, and because of this, they are called waste thinner. The waste thinner is temporarily accumulated in the mentioned tank to be unloaded from the paint shop at the earliest opportunity. Before the completion of capacity of the waste thinner containing tanks, the accumulated thinners are loaded by tankers carrying dangerous chemicals and they are immediately taken out from the company and are sent to chemical industry companies for reprocessing, refining, and recycling. Unloading operations of waste thinner from temporary storage tank located in the circulation hall and loading it by tankers carrying dangerous chemicals are performed periodically and before the completion of the capacity of the tank. The mentioned activity is very important from two perspectives of production and safety. If the unloading operation is not performed timely, the production line of paint shop will be stopped and violation of safety principles and rules of loading and unloading operations would cause accidents and irreparable consequences. Chemical thinner is highly flammable and volatile due to its chemical properties and incidence of any uncontrolled event can result in the release, fire, or explosion of this chemical substance that this can cause damage to people, equipment, or the environment. The bowtie diagram designed for the loading and unloading operations of waste thinner is presented in [Figure 2]. Thinner leakage, ignition, or explosion of the tank and the tankers that contain thinners are among the possible scenarios for loading and unloading operations of waste thinner from the circulation unit of a paint shop is an automotive industry. In the following part, we are going to study the scenario of BLEVE phenomena in the tank of thinner carrying tanker in the station of loading and unloading thinner. The exact details of data recorded in the ALOHA software for processing and determining hazard distance are presented in [Table 1]. After entering all the above information into the software and performing the necessary processing, the radius of danger zone was determined on the basis of released material and the nature of the potential hazards. [Figure 3] shows the threatened areas on the basis of the intensity of thermal radiation. 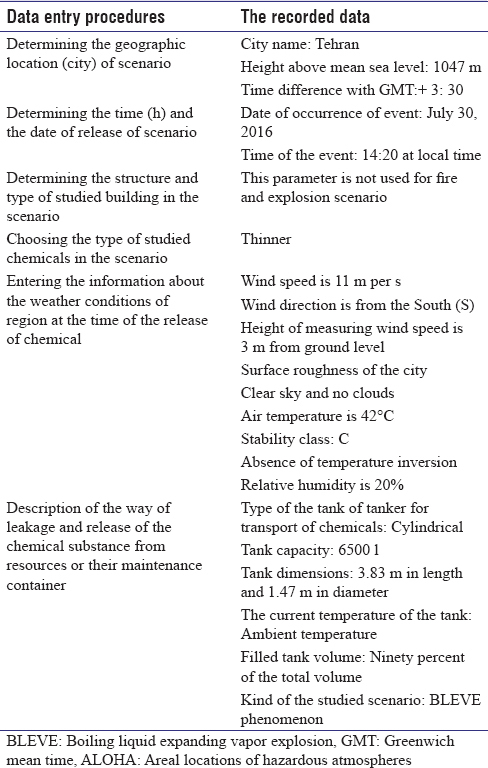 On the basis of the input data, the software has estimated that fireballs resulted from the BLEVE phenomena have an approximate diameter of 102 m and burn for about 8 s.
By looking at the results obtained from risk management of loading operations of waste thinner and modeling of BLEVE phenomenon of thinner tank of chemical tanker, threat zones were fully identified and disaster-prone areas were discovered. All areas that in the accident of BLEVE phenomenon and possible ignition of tank would be caught in flames and the resulted heat were identified. With this information in hand and the results obtained from the scenario of BLEVE phenomenon, we can now make a conclusion about the assessment of the possible consequences of combustion in the tankers. An administrative office has been embedded in the paint shop and at a very short distance from the place of loading and unloading of thinner. The distance of this office with four employees stationed at the place of loading and unloading of thinner is exactly 10 m, while according to the estimation of the software and the input data, fireballs resulted from the BLEVE phenomena have an approximate diameter of 102 m and burn for about 8 s, and also, red threat zone (the worst hazard level) spreads in all directions for about 182 m. The results and figures represent that the area, in which employees are stationed is at very high risk that in the event of a possible fire, the personnel will be quickly caught in fireballs caused by the burning of thinner. According to the results, it was found that one of the administrative units is positioned inappropriately and incorrectly in the vicinity of thinner loading station that in the case of nondisplacement of the mentioned unit and the incident of fire or explosion in the place of loading and unloading of thinner, undoubtedly there would be fire at the mentioned administrative unit. Now that we have analyzed our findings and have obtained clear results about the consequences of fire at the thinner carrying tanker in the place of loading and unloading in circulation unit of a paint shop in the automotive industry, it is time to present effective solutions and recommendations. Since the cost of performing basic reforms and improvements about this issue (relocating offices) would be much less than direct and indirect costs of occurrence of accident for personnel deployed in the vicinity of the loading and unloading position (source of danger); and this relocation is technically applicable, it is recommended to relocate the administrative office and its personnel as quickly as possible and before occurrence of any possible accident. Also in future projects before placing any hardware and software equipment, construction of industrial and administrative buildings disaster-prone areas and potential sources of danger in the surrounding environment should be identified and the necessary inquiries in the field of safety should be obtained from the safety experts and consultants during the design phase, before the implementation and before the imposition of exorbitant costs. Jahangiri M, Norouzi M, Sarban Zadeh K. Risk Management and Assessment: Quantitative Risk Assessment in Process Industries. Vol. II. Tehran: Fan Avaran Publications; 2013. Gohar Rokhi M, Torabi M, Akbari F, Golazhari F. Qualitative and Quantitative Assessment of Risks in the Processing Units. Tehran: Daneshgaran Sanat Proje Publications; 2009. Abdolhamizadeh B, Badri N. Qualitative and Quantitative Assessment of Risk in the Process Industries. Tehran: Andisheh Sara Publications; 2012. Sarayi F. Identification of Process Hazards by Using HAZOP Method. Tehran: Negarandeh Danesh Publications; 2013. Mohammadfam A. Safety Engineering. Tehran: Fan Avaran Publications; 2003. Halvani GH, Zareh M. Engineering of Safety of Systems and Risk Management. Tehran: Sobhan Publications; 2009. Langari M, Shamohamadi A, Rashtchiyan D. “Analysis of Consequence Modeling Software of PHAST and ALOHA”, the First International Conference on Safety and Inspection in Oil and Energy Industries, Tehran; 2010. Sameti M. “The Role of Bowtie Methodin the Improvement and Optimization of the Risk Management Process” Seventh National Congress of Occupational Health, Medical Faculty of Qazvin; 2011. Tekye A, Jafari M, Mortazavi B. Application of Bowtie Techniques in the Analysis of the Accident in SRP Unit of Tehran's Tondgooyan Refinery” Seventh National Congress of Occupational Health, Medical Faculty of Qazvin; 2011. Golbabae F, Avar N, Mohamadfam A. Propane leak propagation modeling in an industry. J Hum Environ 2012;10:1-13. Kabiri S, Khosravi H, Rashidi H, Shiri H. Application of Bow-Tie Method in the Risk Assessment of Pigging Operations of Gas Pipelines in the Tenth Region during the Gas Transmission Operations” Third Scientific Conference on Process Engineering (Oil, Gas, Refining and Petrochemicals), Tehran; 2014. Owari M, Al-Sheikh A, Sadeghi Niyaraki A. Analysis of road accidents caused by the transport of toxic gases in Hassan Abad located on the transit route of Tehran-Bandar Abbas. J Transp Eng 2014;6:197-212. Heyrani P, Baghayi A. Risk assessment of oil and gas transmission pipelines on the basis of Fuzzy Bowtie method. J Occup Health Saf 2016;6:59-70. Beheshti M, Hajizadeh R, Mehri A, Borhani M. Modeling the consequences of hexane leakage from storage tanks and planning an emergency response program in a petrochemical complex. Iran Occup Health J 2016;13:69-79. Komaei M, Alizadeh SH, Keshvari A, Kheyrkhah Z, Moshashai P. Risk assessment and modeling of consequences of the blast wave of BLEVE phenomena of LPG spherical tank in a refinery. J Occup Health Saf 2016;6:10-24. Naserzadeh Z, Alahyaari Mehrabani M, Mirhabibi Z. Training for Risk Assessment Software-LOPA™ Bowtie Pro. Tehran: Fan Avaran Publications; 2013. Tseng JM, Su TS, Kuo CY. 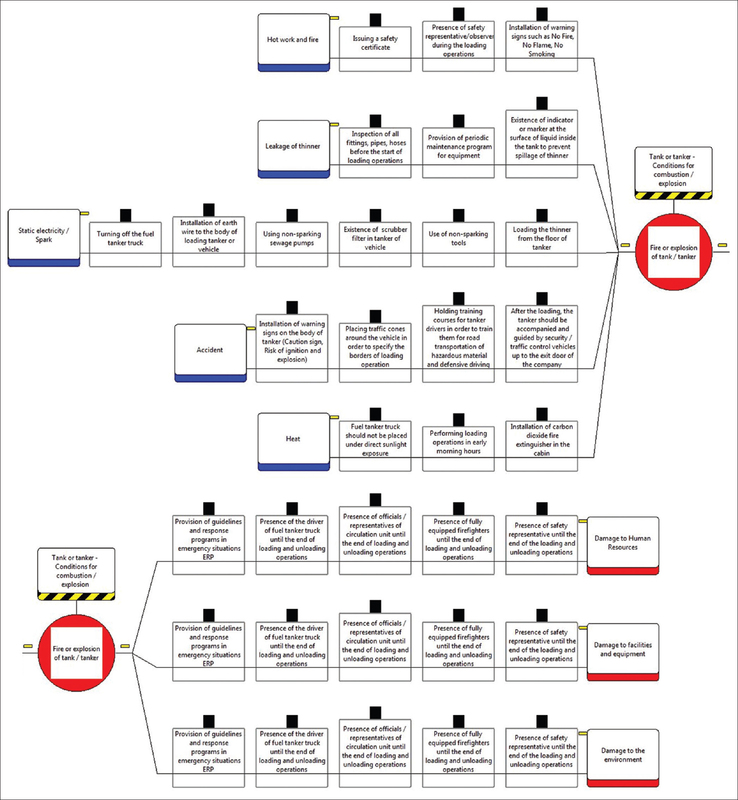 Consequence evaluation of toxic chemical releases by ALOHA. Procedia Eng 2012;45:384-9. Shao H, Duan G. Risk quantitative calculation and ALOHA simulation on the leakage accident of natural gas power plant. Procedia Eng 2012;45:352-9. Naserzadeh Z, Alahyaari Mehrabani M, Kuhpayi H. Training for Consequence Modeling Software of ALOHA. Tehran: Sepidbarg Publications; 2015.
de Ruijter A, Guldenmund F. The bowtie method: A review. Saf Sci 2016;88:211-8. Lewis S, Smith K. Lessons Learned from Real World Application of the Bow-Tie Method, 6th Global Congress on Process Safety; 2010. Lu L, Liang W, Zhang L, Zhang H, Lu Z, Shan J. A comprehensive risk evaluation method for natural gas pipelines by combining a risk matrix with a bow-tie model. J Nat Gas Sci Eng 2015;25:124-33. Mulcahy MB, Boylan C, Sigmann S, Stuart R. Using bowtie methodology to support laboratory hazard identification, risk management, and incident analysis. J Chem Health Saf 2017;24:14-20. Markowski AS, Kotynia A. “Bow-tie” model in layer of protection analysis. Process Saf Environ Prot 2011;89:205-13. BowTie Pro Manual, Version 3.1.5, Published in April, 2013. Available from bowtie pro website, www.bowtiepro.com. Introduction to the Bowtie Methodology. Available from bowtie pro website, www.bowtiepro.com.